In 2016, the Brussels-Capital Region began the preparation of its third Sustainable Urban Mobility Plan (SUMP) in which freight will be the object of a particular attention. The Brussels-Capital Region aims at making the metropolitan area a model of efficient and innovative urban distribution. In applying a comprehensive planning approach, from situation assessment to measure selection and monitoring, Brussels distinguished itself at the European level as the Belgian capital has received the 5th EU Sustainable Urban Mobility Planning Award, on the theme of urban freight. The Brussels-Capital region is the authority in charge of the development of the Sustainable Urban Mobility Plan (SUMP) for the city-region of Brussels. After the preparation and implementation of the first (IRIS 1) and second (IRIS 2) regional SUMPs, respectively in 1997 and 2010, the Brussels-Capital region has started the preparation of its third SUMP (Good Move) in 2016. Since the beginning of the preparation of the third SUMP, it has been decided that freight will be fully integrated in the Good Move plan. This is due to both the successes achieved in the area of freight transport under IRIS 2 and the conclusions of preparatory studies. To build its freight strategy, the Brussels-Capital region can elaborate on a sound strategy called the 'Strategic Plan for Goods Traffic in Brussels-Capital Region', adopted in July 2013 as a specification of the second SUMP of Brussels. This document is the result of a collaborative process for assessing the initial freight situation and defining a common vision for freight. The overall objective of the Brussels regional authority, in terms of freight transport, is to limit the negative environmental impacts of urban freight without compromising the positive economic effects of the sector on the local economy. To achieve this, a total of 36 measures have been selected and incorporated in the SUMP approach, some of them already implemented under IRIS 2, the other measures being included in the Good Move plan. 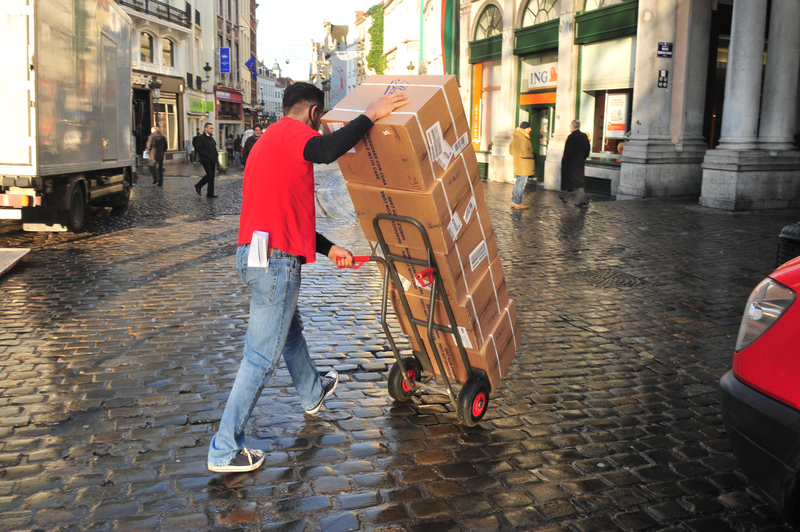 Improve conditions for the delivery personnel. Among the measures, one can highlight, for example, the implementation of a road-charging scheme for lorries, based on the ‘polluter pays’ principle; the support to alternative logistics schemes, like night deliveries and the use of urban consolidation centres; or strong support to the use of alternative freight vehicles, the support to bike couriers and the encouragement to shift traffic towards the canal, especially for bulk and construction materials. To implement the measures, the Brussels-Capital region relies on partnerships with private innovative logistics companies and an involvement in EU-funded projects. The example of the Urban Consolidation Centre (UCC) managed by CityDepot illustrates this. The UCC, located on the edge of Brussels, has been created in the framework of the Interreg IVB LaMiLo project, with the involvement of both the Brussels-Capital region and CityDepot. Since the end of the trial, the UCC is managed by CityDepot without any public subsidies. The region still supports the use of the UCC which proved to be beneficial for traffic reduction. The third SUMP being in the preparation phase, it is too early to analyse the results of the measures themselves. Even though some measures already produced effects, under the previous SUMP, IRIS 2. However, the integration of freight in the planning approach itself can be seen as an achievement. The method used by the Brussels-Capital region is very comprehensive. It started with consultations and studies to assess the initial situation and adopt a vision for freight for the next years. All measures are then selected for their potential to help reaching the goals set in the strategy. The involvement in projects and partnerships with private stakeholders also integrate in the overall strategy. Later in the SUMP process, Brussels plans to evaluate the results of the measures. Thanks to this comprehensive planning approach for freight, this area has been integrated in the SUMP preparation. This has also allowed Brussels to win the fifth EU SUMP award on freight, organised in the framework of EUROPEANMOBILITYWEEK. As described above, the Brussels-Capital region has been judged as particularly good for defining an excellent planning approach for freight, using all opportunities to reach goals set in the strategy. Therefore, the region advises cities and regions to define a systematic approach that fits best their local needs and to integrate the freight strategy in the SUMP development to align best the strategy for the mobility of both the goods and passengers. The co-operation with the public (through public consultations), the local private operators and economic actors (consultations and partnerships) and European and national projects is seen as a major opportunity for the development of a sound strategy for freight.